Twelve years later, Yael is no longer a six year old terrified girl. She is eighteen, and ready to do her part for the world - for the Resistance. She is to assume the identity of Adele Wolfe, a prime example of the Aryan breed - and last years winner of the 1955 Axis Tour. She is to compete once more, with the sole purpose of winning and taking out Hitler when she reaches the end. Yael must convince all around her that she is Adele Wolfe, while riding 20,780 kilometers beginning in Germany and ending in Tokyo while fighting off twenty other competitors who want nothing more than to see her crash and burn. Everything is at stake, and Yael will do anything to cross the line first. I was a huge fan of The Walled City when I read it last year - so I was quick to eye Wolf by Wolf up. Let me just tell you all that Wolf by Wolf exceeded The Walled City by a milestone. Ryan Graudin has outdone herself with this one. I had little to no idea what to expect when I picked this book up. I don't normally read historical fiction, so it was a new experience. But more importantly, I've never read something that was so different than what I've read before. I never sighed, or said "Oh jeez, it's like reading ~this~ book but with a few changes here and there." Not even once. Do you know how rare that is? Very. It was heartwrenchingly brilliant, and powerful. Yael is a character who broke my heart. She has suffered and bled so much throughout her short life. I felt my soul crushed at the idea of a little girl - or any human for that matter, being in such a position. Yael is also one of the strongest characters I've come across. I think because Hitler's reign of terror wasn't all that long ago, makes that bit of the story truly hit home. Because such horrendous experiments did happen to the men, women and children within the death camps. Men, women and children were subjected to starvation and gas chambers. People fell under the tyranny of Adolf Hitler, some believed in his ideals which is nothing short of terrifying. "Illegal smoke curled from their lips like dozens of phantom tongues. White-not black like the billows of Yael's childhood. The ones that poured, day and night, out of tall smokestacks. When Yael was very little, she'd thought a monster lived inside those sooty brick walls. (She knew the truth now. Saw the photos and endless lists of the dead. Rows and rows of numbers like the ones her wolves hid. There was a monster, but it didn't live inside the death camp's crematorium. Its den was much finer-a Chancellery full of stolen art, and doors with iron locks.)" The plot was incredibly unique. I found that it had such a different appeal that I can't seem to properly voice. It honestly takes a creative mind to be able to construct such a vivacious tale for such a dark time in our history. I can still recall my history lessons in the eighth grade when my teacher showed us images (which were extremely graphic) of the horrific results causes by the concentration camps. Even the mere idea of what if Hitler hadn't died in 1945 makes my skin crawl. That the death toll, which was already gruesome, could have been triple what it was makes me sick. But Graudin took the idea with full force and warped it into something that reminded me to be thankful that I live where I do, in a time that I do. I could not predict anything. I panicked a whole lot while reading this because wow, these kids are viscious. Everyone is fighting to accomplish something. Whether it's to bring pride to their country or to kill Hitler, nobody is messing around. It's against the rules to cause harm to another rider, but as long as nobody sees it's wrote off as an accident, which racers use to their advantage. This factor combined with the idea of Yael having to convince her twin brother (Felix), and past lover (Luka) that she is who she pretends to be, made for a heart attack and a half while reading. What I must add is that every single one of the riders was fascinating. Graudin made it so that all her characters are ones you want to know more about. I genuinely hope we get to see some of them again in the sequel. Or even in novellas. I won't give anything away, but I see some HUGE potential there. I'll be sorely disappointed if a few of them aren't more fleshed out. I need the second book now, I don't know how I'll last without knowing what happens next. Wolf by Wolf was achingly beautiful, and crushing. Ryan Graudin writes with such elegant and vivid prose, building up a terrible and treacherous tale. This is not only one of my 2015 favorites - but also a lifetime favorite. After reading this, I am encouraged to try out other books inside its genre. I can't tell you all enough how enthralling Yael's mission was, and how heart stopping the plot that followed was. Also, bring tissues and comfort food while reading, you've been warned. I'm not easily tear jerked, but a certain scene near the last quarter of the book obliterated my soul. Kynndra is currently planning for stuff in 2016 and dying of a back ache due to her terrible posture. This one is definitely not a disappointment, thankfully. Far from it! 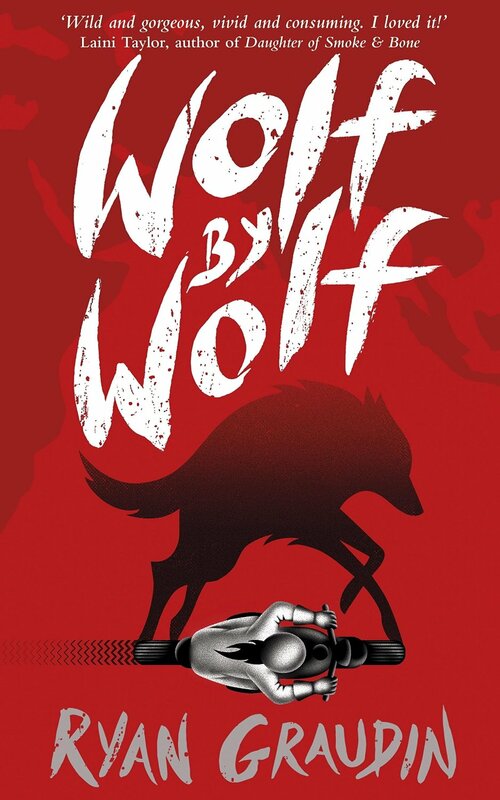 Wolf by Wolf has a very intricate and intriguing plot (there really was never a dull moment). I can't wait until you're able to read it! Thanks so much, Soudha! First of all, I thought Ryan Graudin was a guy and I was going to have to break my #readwomen streak. BUT IT IS NOT SO. YAY. I already have WOLF BY WOLF on my shelf -- it's awfully underrated in the book blogging community, but I am very excited to read it because everyone who's read it recommends it really highly! I absolutely love Historical Fiction and I wish there were more YA HF books. This has been on my TBR for the longest time and I'm hoping to get to it this year. I love the fact that it's such a unique story and it's also very emotional. The writing sounds phenomenal as well. I hope I'll love it as much as you did. I haven't read all that many HF books to be quite honest with you, Nick. But after this one, I can say that I want to read more whenever I possibly can. It truly is one of the more unique stories I've had the pleasure to read. I hope you love it too, can't wait to hear your thoughts when you get to reading it! O.M.G. THIS SOUNDS SO GOOD! Just from reading this quote it just sucked me in! And that's rare for that to happen <3 I can tell why you liked it! I've been looking for a book that makes me want to know more about the characters. Yeah, of course the plot DOES matter but at the same time, THE CHARACTERS are whats makes it special, you know? What a beautiful and convincing review, Kynndra. I’ve seen this book around, but I was on the fence, because Historical Fiction is not a genre that I venture often. Now I’m sold. Also I hope you’ll get rid of you back ache soon. Aww, thanks Ksenia. I'm so pleased that I could convince you to read this. I promise that it is so worth it. I was a bit fidgety too when I learned it was HF but Ryan Graudin has such a unique way of writing that I knew there'd be something special here. My back is doing alright now that I've rested it <33 thanks bub. Wonderful review! I've never read The Walled City, but I DID read Wolf by Wolf and it was fantastic! I'm so glad you liked it as well. It's so scary to think about a different history taking place than the one that did. I knew this book looked familiar! The premise for Walled City is what pulled me in too (I have yet to find the book though, and make time to read it...eek) and I'm so glad Wolf by Wolf doesn't disappoint at all (that is ALWAYS a fear for me, but if it's a good first book I usually anticipate the second one to end). I love "what ifs" (which is why historical fiction rocks) and this one is pretty big. I want to read more stories on "what ifs" on if the Axis had won - it's eerie, but different histories to ours are just futures waiting to happen, are they not? You're certainly right, Mawa. It is so eerie to really think about all the different paths our history could have been led down. I'm really enjoying that concept and the creativity of it all - that's mostly why I really want to try out more Historical Fiction. I hope you're able to get your hands on both books which are incredible! I've only heard amazing things about this book and I'm really intrigued by it! And you call it a lifetime favourite? I need to check this out. I feel awful because this one was not on my radar at all but after reading the synopsis and your review i'm dying to get it in my hands. I'm definitely making it a priority to finding it. Lovely review! THOSE QUOTES. I wasn't a huge fan of Ryan Graudin's debut-which I'm pretty sure was All That Glows (my memory-gah) but it sounds like the writing and characters are totally different and have improved. Yael sounds like an absolutely fascinating and amazing character! I haven't read All That Glows. But I thing Ryan's writing is so good, and I would be led to believe that it has improved. THERE'S SO MANY AMAZING QUOTES IN THIS BOOK OKAY. Yael is a hella amazing character, I loved her dearly. Beautiful review, Kynndra! I LOVE historical fiction and I've only heard good things about both The Walled City and Wolf by Wolf. I think it's about time that I picked them both up! I am so so excited, I am about to start reading this book today! Hitler and everything to do with his time period and WW2 is one of the best subjects I studied in history in school and I am totally obsessed with history. The idea of this book already just makes me want to devour it. Your review has me even more ecstatic to read it because it sounds absolutely wonderful. History was one of my favorite subjects in school too, Josie. I took AP History whenever it was available because I wanted to dig deep into the different time periods - it was all so fascinating to me (even the dark stuff) but I can't say I've read all that many Historical Fiction books. I plan to change that! I really hope you like this book as much as I did, it's a gem c: thanks! I got Wolf by Wolf in my Illumicrate subscription box and your review makes me wanna pick it up right now! I need something unique and non contemporary right now. That's so awesome they had it Mel, I've always wanted to subscribe to one of those to see what they're all about. PICK IT UP ASAP. It's genuinely something unique, I think you'll enjoy it! Aww, thanks Anissa! That's all Kelly, nothing to do with me. She's a brilliant designer and is the reason this place looks so great! Ahh! I really hope you love it (I think you will, no doubt). I am SO excited to read your lovely review of this one! I was a bit underwhelmed by The Walled City, BUT I loved the writing and the synopsis for Wolf by Wolf and am crossing my fingers. Somehow, I feel like this one has slipped under the radar a bit (and that there was a lot of hype for TWC, so that's weird), and I am glad to see it getting some love! And the thing that was missing for me in TWC was FEELS, so I am so excited to hear that Yael and her story are so moving. Fabulous review! Awh, thank you very much Shannon. It's understandable, I really enjoyed The Walled City, but I too found that it did lack the feelings that Graudin implemented into Wolf by Wolf which made the book so much better. I'm so sad to see that not many have payed much heed towards WBW - it deserves the hype for sure. I can't wait for you to read it, Shan! I am beyond excited to read this book. I recently received it in my Illumicrate and have seen nothing but glowing reviews for t. I have yet to read the authors other book, but I am sure it is one I will be wanting to get to after this. It has such an intriguing premise, love the sound of the alternate history. I am so excited to get to this now. I haven't read anything from Graudin before, but this one has intrigued me since I first saw ARC reviews for it. I got a copy yesterday, and think I'll be pushing it up my TBR once my exams are over! This was a great review, and I'm glad it wasn't predictable - I just hate it when that ruins a book! Gosh Kynndra, this sounds so totally heart wrenching and emotional, especially since it covers such a dark time. The writing sounds absolutely stunning too! Lovely review! So yes, the sequel is a must-read for me. THE ENDING GAVE ME A BLOODY STROKE. For real, I was NOT expecting it at all. Ah, yes. The romance was a little strange, I'll definitely give you that. But I lowkey really like Luka I just need to KNOW MORE ABOUT HIM. *screeches w/you* I can't wait for that reveal. It will be amazing.. Or heartbreaking. Who knows. the cover looks so amazing. I think i might read it this year, but i also have MANY tbr books to read D: dilemma. I too loved Wolf by Wolf and I added it to my underrated books of 2015.